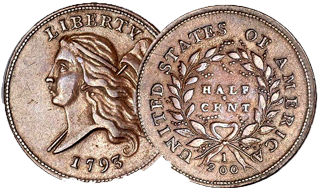 The half cent coin is the smallest denomination of United States coin ever minted. 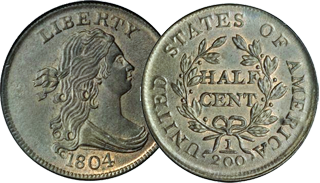 First authorized by the Coinage Act of 1792 on April 2, 1792, the half cent coin was produced in the United States from 1793 to 1857. 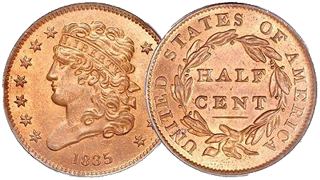 The half cent coin was made of 100% copper and was valued at five milles, or one two-hundredth of a dollar. It was slightly smaller than a modern U.S. quarter with diameters 22 mm (1793), 23.5 mm (1794–1836) and 23 mm (1840–1857). 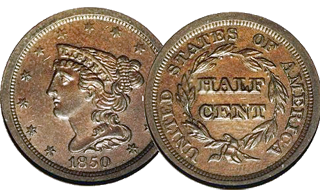 Coinage was discontinued by the Coinage Act of February 21, 1857. They were produced at the Philadelphia Mint.